First birthday parties are so memorable for us new moms, and I wanted Baby J’s to be fabulous. What could possibly be more elegant and glamorous than a 1920s, Great Gatsby themed party!?! This party had a lot of DIYs–the backdrop, the photo booth, the Ferrero Rocher tower, the cake smash photo backdrop, the ostrich feather bouquet, the baked goods, and the crystal tree. Nothing was too complicated and it all turned out perfectly! 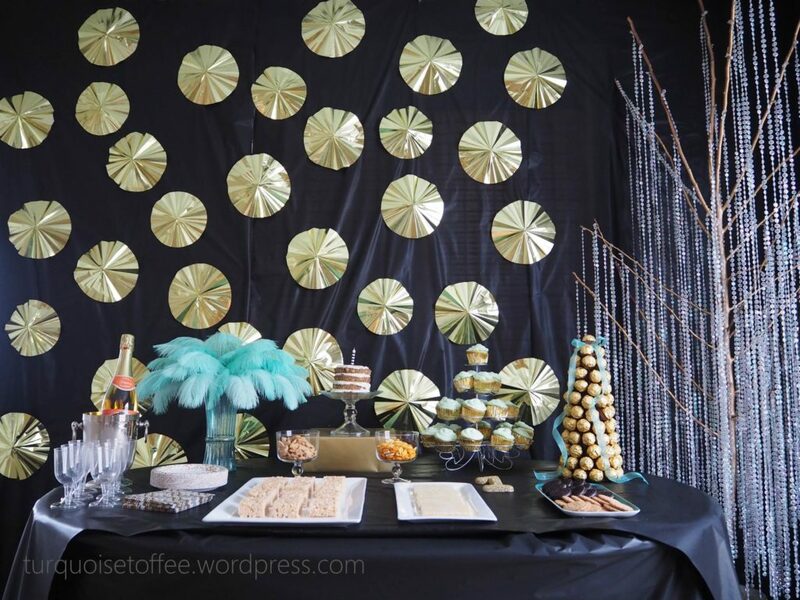 For the details of all the DIY projects check out my post Great Gatsby First Birthday Party for Baby J.
I kept the food simple since it was a small guest list, but everything tasted delicious. I always add vanilla cake batter mix to my Rice Crispy Squares to make them extra special. And that Ferrero Rocher tower was really simple to make, come to the blog for the tutorial! We drank sparkling juice and I even let Baby J have a taste, oh the face she made was precious! I had 1920s jazz music playing in the background, and both me and Baby J dressed up in our fanciest flapper dresses and headbands. Of course I did more than a couple photo shoots of my sweet baby, but by the time we made it to the photo booth she was fast asleep--she definitely partied like Gatsby!